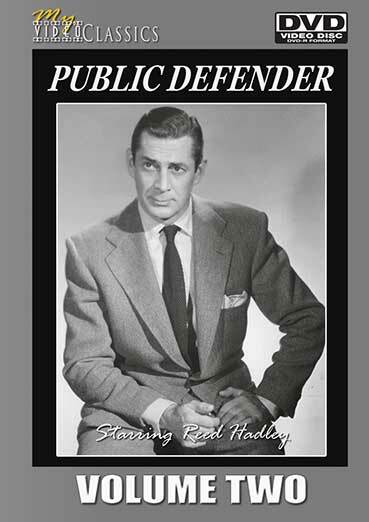 After many months of work, we are proud to present our collection of Public Defender TV classics. These shows were transferred from original assets and are not copies of any other previously released versions. Public Defender Vol. 2 includes thirty beautiful quality episodes in a 6 DVD set. Moonshine, The Man Who Couldn’t Remember, Deep Ditch, Gunpoint, Mama’s Boy, Open Season, Your Witness, Big Steel, Jackpot, Hitchhiker, Brutality, Cornered, The Sapphire Mink, The Stepfather, End of the Line, Clifford Pike, Eight out of a Hundred, Condemned, Operation Cleat, The Nora Fulton Story, Jockey and the Nun, The Case of Peter Stone, Harry Nelson, The Blinding Light, The Arsonist, Love and Conscience, They Never Came Back, Let Justice Be Done, The Bachman Case.